Standard and Poor’s Rating Services have been expanding their use of e-books to communicate with key audiences. E-books allow S&P to concentrate their extensive and diverse content output (news, industry commentaries, video interviews etc.) into a single, targeted media channel. While IFR Outlook, for example, is aimed at communicating information effectively to the infrastructure sector, CreditWeek takes a look at the global credit markets on a weekly basis, providing credit rating news and analysis, and like its counterpart recently been converted into an e-book format . Dubai Aluminium (DUBAL) is one of the largest non-oil contributors to Dubai’s economy, yet running a somewhat primitive manual cash management system meant that its success was not always assured. Not only was this system inefficient, but it also exposed the company to error and fraud and led to a loss of value and dissatisfied suppliers. A case study in Aluminium International Today describes how DUBAL collaborated with Citibank to implement the CitiDirect Online Banking System, which has resulted in 99% of DUBAL’s payments to suppliers being made electronically, and has led to increased efficiency and improved supplier relationships. In order to keep its clients and stakeholders in the sector up to date, Standard & Poor’s releases a monthly newsletter entitled Infrastructure Finance Outlook (IFR Outlook), containing the latest research from S&P Ratings Services, alongside up-to-date news of rating actions and market trends across the EMEA infrastructure sector. Distributed in both pdf and e-book form, this month’s issue covers S&P’s appearance at Rio+20, the dangers of sovereign distress to EMEA utilities, comprehensive news on the utilities, transport, and project finance sectors, and much else. Viewing IFR Outlook as an e-book provides access to exclusive video content, and the ability to download relevant research and ratings reports. The need for significant public and private investment in the renewable energy sector was a hot topic for Standard & Poor’s at the recent Rio+20 corporate sustainability forum, which took place 20 years after the landmark 1992 Earth Summit in Rio de Janeiro. At a panel discussion at the event, Regina Nunes, Head of South Cone Latin America for S&P Ratings, spoke in depth about how meeting clean energy financing targets requires an unprecedented level of investment, and how success will rely heavily on attracting an increasing number of other investor pools – including private equity, pension funds and the capital markets. Following the event, our outreach resulted in coverage of Nunes’ speech on Reuters, as well as in specialist publications Environmental Finance and New Energy World. What’s more, the coverage prompted response from a number of specialist blogs including 24/7 Wall Street (a blog aimed at global investors) and the Wall Street Journal’s MarketWatch blog. Bank regulations – particularly the upcoming Basel III Accord – are currently a subject of great debate, but the insurance industry is facing its own regulatory challenge in the form of Solvency II. Writing in Trade and Forfaiting Review, BNY Mellon’s Paul Traynor, Head of Insurance Services EMEA, discusses how insurers can best prepare to ensure a smooth transition to the new regulatory environment. Bank analyst Alex Koagne, who sits within Natixis’ Equities Research group in Paris, provides the FT with an explanation for the biggest one-day rally in Greek banking shares for 10 months. Ahead of Greece’s key June elections, strong poll results and the anticipated victory for New Democracy evidently gave investors renewed confidence in the Greek banking sector. Infrastructure finance has undergone a number of changes in recent years, the most noticeable being the rise of public-private partnerships and variant funding models. But as the world’s population becomes increasingly urbanised and the pressure on urban infrastructure continues to grow, there is a clear opportunity for private sector financiers to increase their involvement – and to bring with them a range of new benefits. Writing in Project Finance International, Johannes Schmidt, CEO Project and Structured Finance, Infrastructure & Cities at Siemens Financial Services, discusses the changing nature of infrastructure finance, the increasing need for innovate financing solutions, and the role that private finance has to play in the future of our cities. The government wants to encourage private sector funds into under-resourced UK road infrastructure. But how best to attract the levels of investment required from pension funds, sovereign wealth funds and other institutional investors? In a thought-piece published in Infrastructure Journal, Ashley Blows, Global Head of Infrastructure in the Project Finance group at Natixis, describes the sort of revenue structures and economic incentives that may be required. As financial constraints and stringent regulatory proposals prompt banks to streamline their balance sheets and scale back lending, corporates are left without the vital injections of capital they require. Falcon Group – with Moorgate’s help – held its third annual trade finance forum to discuss how alternative financiers are increasingly filling the gap left by banks withdrawing from trade finance – providing corporates with sophisticated funding solutions. The event, as described in Trade & Forfaiting Review, was moderated by BBC World News’ Nima Abu Wardeh, and gathered delegates to listen to speeches made by some of the leading names in the industry. 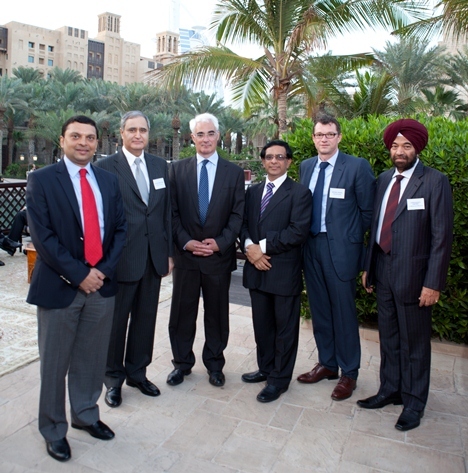 The list of speakers included: keynote speaker Rt Hon Alistair Darling MP, Abheek Barua, Chief Economist, HDFC Bank, Michael Spiegel, Head of Trade Finance and Cash Management for Corporates, Deutsche Bank and Mark Giles, Board Director of Alhamrani Group of Companies. BPL Global is a name synonymous with the growth of the Political Risk Insurance (PRI) market – a growth that is producing a new medium and long term (MLT) export credit insurance market, where ECAs and private insurers compete with each other to provide comprehensive non-payment and related covers for capital goods exports, foreign projects and their financiers. Charles Berry, Chairman of BPL Global, writes in the latest issue of Trade & Forfaiting Review that a competitive market place will deliver benefits to exporters and banks by offering choice and by strengthening both ECAs and private insurers. But for it to truly thrive, regulators must update their view of export credit insurance, not least as many in the private PRI market feel the playing field is tilted in favour of the ECAs.